Art is the product of the emotion and interpretation of the world that its creator seeks to convey. It is because our visions of the world are so numerous that we can enjoy a world filled with color and creativity. That's what we think at Sensories Lab, and as such, we accompany our customers in expressing their own artistic needs. For that, we are able to create unique works, adapted exclusively to your projects. It is through a process of personalized support and in collaboration with our artists that we arrive at this result: your own vision of the world. Hundreds of bright LED balls come alive as visitors pass by, depending on the volume of traffic, the traffic on the motorway above the tunnel.. to create creative and fun atmospheres. They come alive together in a show of colors that vary according to the environment. They can make a place considered unattractive, a welcoming place, creative and mysterious. A creative user experience can take many forms. In this case, the camera scans the visitor's face in real time and retransmits it on a screen. The client is then in front of a mirror that displays bright creations and the effects of different types of products on her face. With the possibility of working in half-face to represent the result using the chosen product. The creation upstream with the artist allows to obtain a creative work, able to marry all the forms of an architecture. The resulting colored projection, which can be coupled with a sound creation, provides a spectacular experience for the participants. 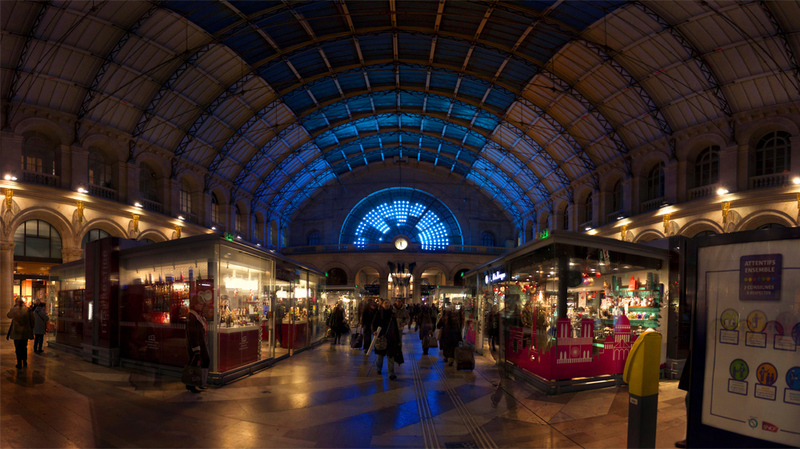 A monumental interactive installation present at the Gare de l'Est for 3 months. This work comes alive to the rhythm of the comings and goings of travelers. It adapts to the environment without damaging the architecture of this historic building.